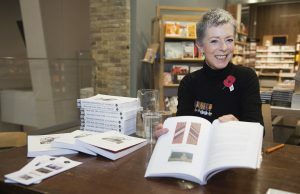 Alexis Penny Casdagli, on behalf of A T Casdagli (1906-1996), signed copies of Prouder Than Ever at the Imperial War Museum. It was an extraordinarily moving event as, in 1982, Major A T Casdagli lodged the typescript of his secret war diary with the Archives of the IWM and now, almost 35 years later, that diary is now a much praised book. Photograph courtesy of the IWM.